At my age, I don’t need any more money, but a lot of great causes do,” says Maurice Kanbar. “This idea of selling a whole lot of great vodka and giving away money might not get me into heaven, but it will be fun trying. And, I’m sure we’ll be able to do a lot of good. Blue Angel vodka, a new spirits brand, is being launched today by its founder Maurice Kanbar, who will donate its proceeds to benefit charitable causes. Maurice Kanbar, a spirits-industry legend, created one of world’s best-selling premium vodka brands and sold it in 2002. Since then, he’s given away tens of millions of dollars to charitable causes. Now, at 89 years old, he wants to do it one more time. Kanbar, a lifelong martini lover and serial inventor, is launching his most refined, best-tasting vodka yet with a singular goal of funding more philanthropic generosity. Blue Angel vodka has already won a 2017 Double Gold at the San Francisco World Spirits Competition. 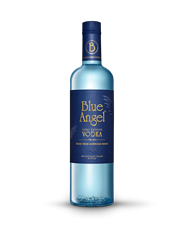 Blue Angel vodka, made from all-American corn and gluten free, goes through a 6X distillation process to filter out impurities (congeners). The water used from Fairfield, California is further filtrated through deionization and reverse osmosis to remove more impurities at a molecular level. Kanbar’s past philanthropic donations have centered on education, healthcare and the arts including $21 million donated to Philadelphia University, his alma mater, where he earned a chemistry degree, $5 million to NYU’s Tisch School of the Arts, and $1 million to the Osher Center endowment campaign to help conduct research and train the next generation of doctors, nurses and pharmacists at UCSF’s world-class medical school. He’s also donated money to create the Kanbar Cardiac Center at the California Pacific Medical Center and has provided financial backing for KQED’s “ImageMakers” series of independent films. Southern Glazer’s Wine & Spirits, the nation’s largest wine and spirits distributor, is rolling out Blue Angel vodka in the San Francisco Bay Area first. The ultra-premium vodka will be aggressively priced at $19.99 MSRP for a 750ML bottle to encourage faster trial and adoption.